Tapasia review – is the food any better than the pun-fully bad name? More restaurants than ever are opening in Soho despite the relative scarcity of real estate and Tapasia is one of the newest. This small bar and restaurant, located on bustling Old Compton Street, serves up Asian-inspired tapas which isn’t as strange as it first sounds. Chinese dim sum and Spanish tapas share a similar basic idea after all – order lots of small dishes to be shared with others. The small space is tastefully and inoffensively decorated, although I could have done without the cheesy muzak. The staff are friendly and I did feel especially sorry for my Eastern European waitress who managed to maintain her composure despite being bellowed at by another customer, a portly provincial housewife. The Hyacinth Bucket-like character spoke to the waitress in an unforgivably loud and condescending manner. Since I dined at Tapasia by myself (having tapas by myself isn’t the silliest thing I’ve ever done) and I’m a non-drinker, I can’t comment about the wine list, but I did try some of the more interesting dishes on the short menu. 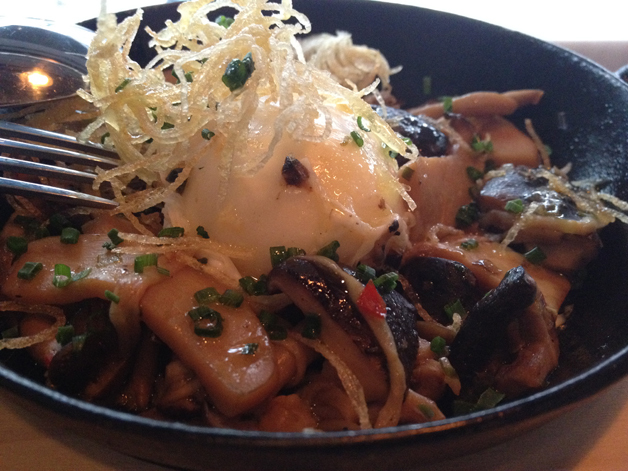 I started off with the duck egg and mushrooms. The soft and silky enoki and shiitake mushrooms were well chosen and tasted great, but the yolk of the gently poached egg wasn’t as rich as I was expecting so it contributed little to the overall dish. 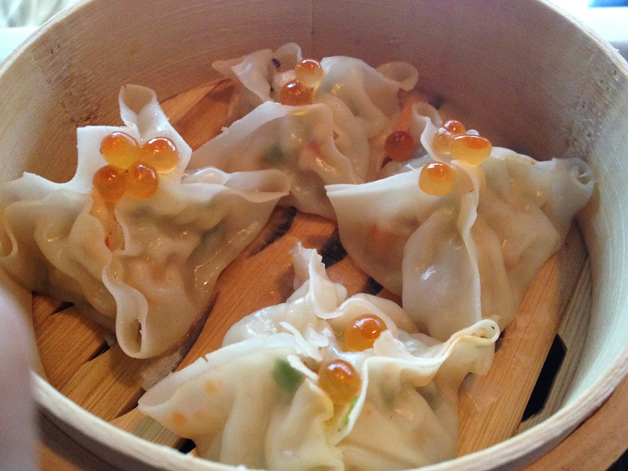 Cantonese shu mai dumplings are usually filled with a mixture of pork and prawns, but here the filling consists of lobster and each dumpling is topped off with ikura or salmon roe. Although that may sound appetising and they certainly look pretty, the preparation and cooking wasn’t up to scratch. The skins were too thin and fragile. The lobster filling, although firm and a touch salty, was otherwise very anonymous and could’ve easily been mistaken for a less glamorous fish. The only highlight was the rich and oily ikura, but that can’t rescue a very disappointing dish. 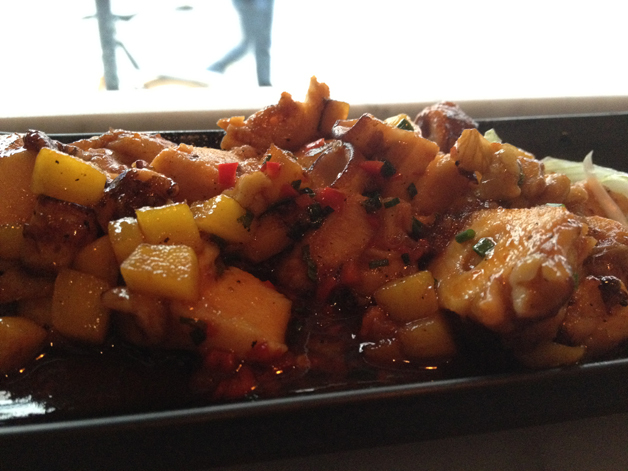 Octopus with mango and walnuts sounds like an intriguing combination. While the slices of meaty octopus were firm, there weren’t enough walnuts and the diced pieces of mango had lost much of their taste as well as their texture. Most of the flavour came instead from the fruity, spicy sauce but this had become oddly separated with the spiciness concentrated on one side and the sweetness on the other. This seems rather unnecessary since the contrasting flavours work quite well together. One of the few things I love more than sashimi is foie gras so any dish that combines the two immediately grabs my attention but I shouldn’t have gotten my hopes up. The thin slices of tuna were so heavily flavoured with soy sauce and ginger that it was impossible to taste anything of the actual fish itself. The foie gras on the other hand was a parody of itself, with excessive amounts of fattiness and saltiness obscuring any depth of flavour if it was ever there to begin with. Combining the two clashing melanges of flavours was a mistake I won’t be repeating again (sorry folks, no photo of this one). Lotus root is an interesting ingredient and here it’s been combined with sticky rice and pineapple ice cream to make a dessert. The sweet, starchy and nutty lotus root has been placed on top of soft, sweet sticky rice, while a small dollop of rather average vanilla ice cream rests on a small bed of sugary candied pineapple diced into cubes. Both are quite pleasing in their own right, but they don’t really work when combined together and feel like two separate desserts on a plate rather than a carefully constructed, unified dish in its own right. 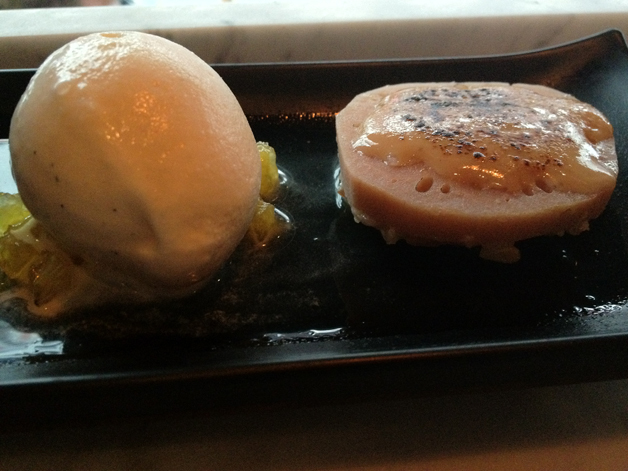 Pineapple and ice cream on the left, lotus root and sticky rice on the right. Obviously. Frankly, my meal at Tapasia was a mess. Some dishes, such as the lobster shu mai and the sashimi with foie gras, were woefully bad and need to be dramatically rethought while others have potential but are spoiled by thoughtless preparation, shoddy ingredients or both. I’m not sure if the fault lies with the kitchen or with the very idea of combining two superficially similar but ultimately disparate cuisines into something new. Either way, Tapasia isn’t somewhere I will be returning to soon. Opening Hours: call to confirm. Total cost for one person including soft drinks: £40 (I paid approx. £20 during the extended soft launch opening period which runs until the end of June 2012). Tags: duck, dumpling, egg, foie gras, lobster, london, lotus root, mango, mushrooms, octopus, pineapple, restaurant review, rice, sashimi, sorbet, tapasia, tuna, walnuts. Bookmark the permalink. Previous post ← The Old Dairy review – fresh curds or sour milk? I thought the food was expensive for what we got and considering the options around that area, Tapasia……….we could get better food close by. Easily.